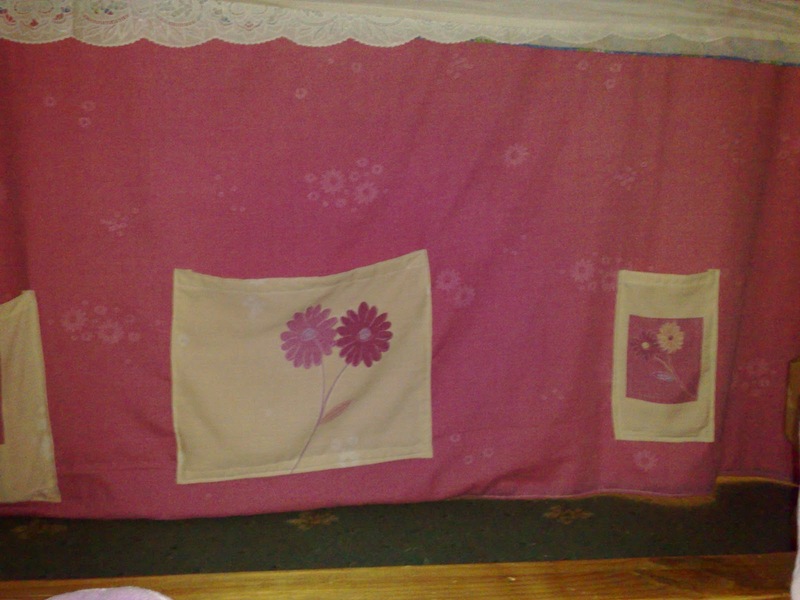 Kids love to make tents in the house using blankets and sheets which are thrown over the furniture. I remember doing this myself as a child, which seems an eternity away! I have spent many years putting these tents together for my three kids and spent forever putting them back together once they collapse because one of them has pulled at the sides. The last time I did this, I got so upset because they were shouting at each other blaming each other for knocking the tent over. I thought to myself, there must be an easier way to do this, and that is when I thought about a fitted tent. I went online to get some inspiration and couldn’t believe the amount of table tent tutorials there were on the internet. Most of them were for the classic Card Table Tent. I however needed a large tent to cover my large dining room table. I took ideas from the various tents I had seen and came up with my own design. I had two single quilt covers spare which were similar in design and thought these would be perfect for the tent. I didn’t really think about making it look nice just as long as it fitted over the table. However I did try my best to make it look acceptable. Some tents on the internet look like real miniture houses with their own letter boxes and door numbers! My tent however, was just going to have a quick simple design. 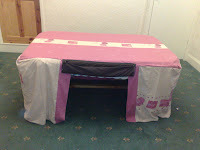 I had the material for the basic sides and top of the tent from the quilt covers. I also used an old brown skirt that had belonged to my eldest daughter for the front door. I put the door on one of the longest sides and then I used press studs for fasteners to keep the door open if needed. The door just rolls up to open and unrolls to close. 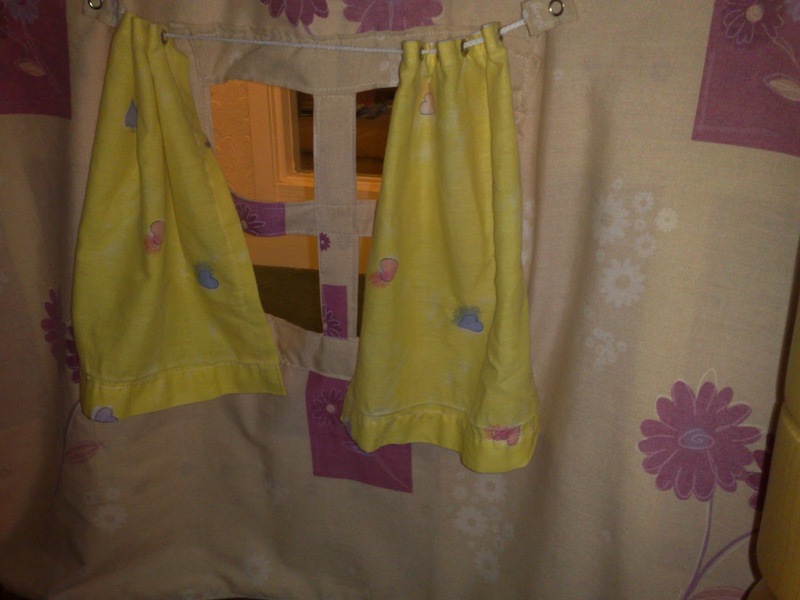 I also added a window to each of the short sides of the table so that the kids could look out of the tent. 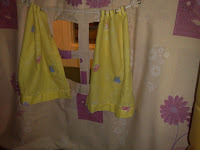 Once I had made the tent the kids also decided that they wanted curtains added to the windows. I made some curtains with some other spare material and fastened these to the tent in a way that they could be left open or closed. The kids can now have privacy! I also added some large pockets to the inside of the tent. These come in handy for the kids to put their books or toys into. I keep this tent folded up inside a bag and I keep it handy for when the kids want to play with it. It is so simple to just take out and throw over the table, and also to fold up and put away. And the best part, it never collapses which keeps me and the kids happy! You can find many tutorials on the internet just do a search for 'table tent tutorials'.